Two new works from Paul Erlenborn were delivered to the shop and gallery this week. A trompe l'oeil painting, and a one-of-a-kind re-purposed table created with found vintage materials from many sources. The artist describes his inventive, creative process here, along with his inspirations. Paul Erlenborn, "Man The Machine", acrylic on panel, 32" x 24"
"The concept for "Man the Machine" had been in mind for over a year and was the second in a series using similar subject matter, that being an antique elevator governor device along with a wooden artist model mannequin. The idea came out of sheer play as my studio is often filled with objects that inspire me. Both this painting as well as the first that was named "The Governed" came from my love of mechanical devices, antiquities, as well as weathered surfaces. The way that light plays off of all of these is of particular importance to me. I've always felt that man's creations become more beautiful through the processes that nature puts them through; oxidation, rust, weathered paint etc. My years of faux finishing came into play when it came to rendering the wood grain and the distressed qualities of both the wood and the machine.Both brushes and trowels were employed in the creation of this work. I very consciously aimed at the play of warm colors against cool to create an illusion of depth. I felt that the mannequin added a sense of life to what might otherwise be lifeless and still and at the same time be more in context to the mechanistic feel of the painting rather than having a warm blooded person "operating" the machine. I have framed this painting in my signature style frame, that of copper pipe as no other frame seems to connect to the industrial feel of the imagery as well. But for the first time a painted finish on the copper seemed to be in order and here was the opportunity to connect even further through the use of color as well as distress and the look of oxidation. I should also mention that the elevator governor is in my possession (the blue green one in the painting) and that it came out of a fabric mill in West Warwick Rhode Island. Not sure the age on this one but the mill was established in the nineteenth Century. I feel this governor, that was the braking mechanism for the freight elevator, might have been made in the 1940's. That mill was later turned into condos and that is when this device was pulled from the building." "This kitchen work table is a great example of re-purposing of bits and pieces of antiquity. 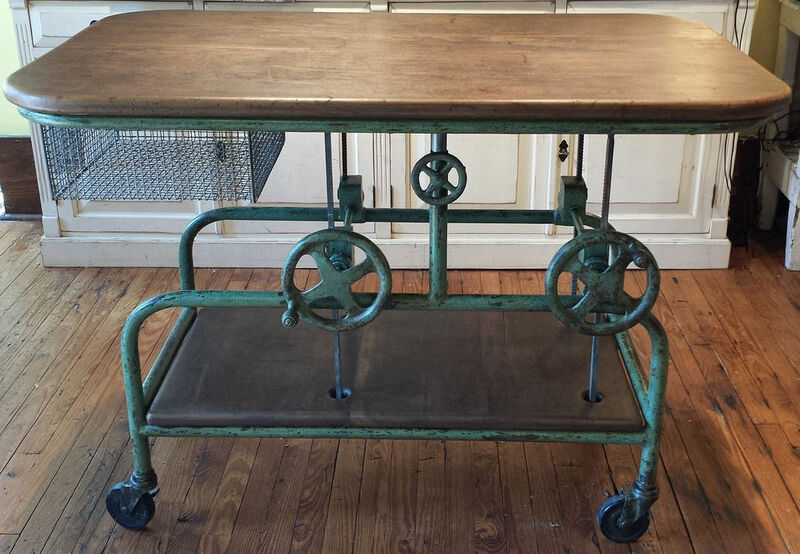 Much of the base of this piece, including the turn wheels and gearing mechanism, as well as the casters were once an early 20th C. doctors office table. However, both the work surface as well as the under shelf were cut from a 20 ft work table from a bakery in Warrenton. The function of the turn wheels has been adapted so that one can raise and lower the work surface to fit one's individual preferences of height. The tubular steel parts of the table top have been newly made to fit the base but also to be of convenient size to fit many different kitchen spaces. The small lock knob wheels were once part of a refrigeration system in an apple packing facility in Sperryville and now serve to lock the table at the desired height. Once the entire piece had been constructed, I painted all of the steel parts in a faux peeling and "rusty" finish. The wooden surfaces have been treated with a food safe butcher block conditioner made by Howard products, (available at Home Depot), that contains mineral oil, carnauba wax, as well as beeswax."